We said we’d had enough. No more digging through trash in hopes of scoring somebody’s SSN. No more eavesdropping on cell phone conversations, on the chance we’d hear a credit card number we could memorize. No more sprees of mail-order merchandise. No more pretending to be someone else. We’d get by with what we had. We’d be who we were. We’d be like you. So one Saturday, we went grocery shopping. Maybe you saw us, Edie pushing the cart, me tagging along. I didn’t like the way my wallet felt in the hip pocket of my Levi’s, so I asked her to please tote it. She slipped it into her handbag, an Ed Hardy designer leopard print with red hearts and flowers. She’d bought it on a stranger’s credit. We weighed the merits of organic Braeburn apples over the waxy Red Delicious and their pesticide residue, and we felt good about ourselves when we chose the former. We picked out the best bunch of leaf lettuce and snugged it into a plastic bag. We chose red grapes, refusing to lower ourselves to sample them first. We’d buy on good faith. How could we resist a bouquet of fresh-cut flowers—pink lilies, white hydrangeas, red roses, and something Edie called lisianthus, a ruffled purple flower that looked so delicate I thought how dear the day was, this bright sunny morning in June, and how grand it felt to be on the up-and-up. He was about my age, but unlike me, he was fat. I don’t say this to be mean. I just want to be honest about everything. He wore a pair of blue shorts, tight on his doughy thighs, a white polo shirt that didn’t quite cover his navel. His chin had given way to three or four others. But his hands—they were small and dainty, the fingers thin and short, as if they belonged to someone else. Those fingers were sorting through the Brach’s candies that the store offered in bulk. There was a scoop to shovel the individually wrapped candies into a paper sack, but this man was taking his time, plucking out a root beer barrel or two, a few butterscotch discs, and then some caramels. “Leave him alone,” I said, but she wasn’t listening. I grabbed the cart, but she pushed it out of my grip. Just like that, she was on the move. A few weeks before, we’d used a pinched credit card number to order scads of delicacies from Harry and David: summer sausages, raspberry galettes, Havarti cheese, pepper and onion relish, Bing cherry chocolates, frosted strawberry cookies, Caramel Moose Munch. We gorged ourselves. The shame was what led us, finally, to say we’d had enough. It was what had brought us to Kroger on this June morning to pick out some food and pay for it with our own cash, just the way folks do. But there was this man, this fat man with his dainty hands, and Edie was about to humiliate him. He tugged on the hem of his shirt, trying to cover his belly, and, watching him, my heart broke over the thought of what it must have taken for him to get through each day. The fat man turned at the sound of my voice, and because Edie was looking back at me, stupefied, she couldn’t see that he was about to grab onto her, about to close his fingers around her skinny arm. Then the security officer appeared, a man who did things SOP. I could tell by the spit-polished oxfords, the creased black trousers, the pressed white shirt, the crisply knotted necktie, the fresh shave, the way he called me, sir. “What’s the trouble, sir?” he asked and before I knew it we were in his little office, Edie and me, and the officer was poking around in her Ed Hardy bag. He took out my wallet and opened it. “What’s your name?” he asked me. I looked at Edie. She was staring off into space. My wallet was full of fake ids and stolen plastic. “Sir, what’s your name?” the officer asked again, and for the life of me, I didn’t know what to say. I could hear the noise from the store—the beeps of the cashiers’ scanners, the rattling of shopping carts, the Muzak, the murmur of voices. All your voices. Just a Saturday at the grocery store for you, a part of your regular come-and-go. You had no idea what had just happened. Not even the fat man knew how lucky he was. He didn’t know what I’d saved him. He didn’t know what I’d taken before it was his. 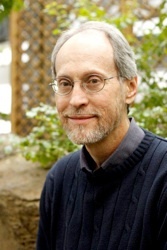 Lee Martin is the author of the novels The Bright Forever, a finalist for the 2006 Pulitzer Prize in Fiction; Break the Skin; River of Heaven; and Quakertown. He has also published two memoirs, From Our House and Turning Bones, and a short story collection, The Least You Need To Know. He teaches in the MFA program at The Ohio State University.